Now is the time to prepare your car for the Winter conditions that lie ahead, tyre manufacturer Michelin advises. In winter, as temperatures head into single figures, the advice is that motorists would fit tyres designed specifically for winter conditions with compounds that remain flexible to improve grip and braking. In this respect, the launch recently of their CrossClimate+ fitments – built to offer improved traction on snow-covered or wet and cold roads as well as year-round performance – has put the French tyre manufacturer on the front foot. Designed to counter the changeable weather that constantly afflicts Irish roads, Michelin says the new range offers the benefits of a summer tyre for dry and wet braking, energy efficiency and total mileage, while also boasting the braking performance and traction of a winter tyre on cold and snow-covered roads – with little difference in performance as the tyre tread wears down. 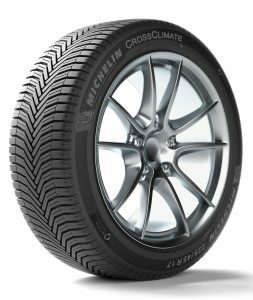 Following a series of extensive independent tests, Michelin’s CrossClimate+ range – currently available in 15 to 18-inch sizes – has recently been named as the ‘best all-season tyre’ by UK motoring magazine Auto Express. According to the publication, the launch of the CrossClimate in 2015 “shook up the world of all-season tyres”, and now the CrossClimate+ builds on this with improved performance and durability.